David H. Dunkle, M.D. 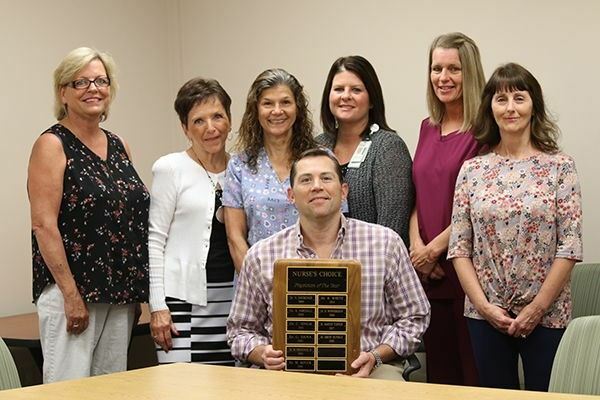 was announced the 2018 Physician of the Year at this morning's physician staff meeting. Nine physicians were considered for the award from nominations received from patients and peers. Comments received about Dr. Dunkle included, “He saved my life.” Another patient amusingly said “She loves Dr. Dunkle and even her husband thinks he’s great”. Other nomination accolades noted by Anita Keller, Chief Nursing Officer at JMH, as she presented the award to Dr. Dunkle, “He is always welcoming and respectful to his patients”, “He always goes above and beyond” and “He really cares about his patients and his patients know that”. Dr. Dunkle is a family medicine specialist and sees patients in his Franklin and Stones Crossing Health Pavilion offices.